I never thought recovery was possible for me. In fact, I honestly believed it was just a make-believe word that truly never existed. But that was far from the truth. At 13 I began struggling with eating disorder behaviors. I would go through periods of restricting then binging and purging, but never at the same time. I quickly learned that by alternating behaviors my parents would never catch on to what I was doing. I didn’t start doing this because of wanting to look a certain way or to fit in a school. For me, this was all about survival. Having grown up in an abusive home, I believed that it was my body that had betrayed me, so I would have to find a way to punish it, to control it in order to stay safe (or so I thought). Nothing I did made me feel safe, and I hated my body more and more each day. My eating disorder (ED) fueled my depression, leaving me feeling completely hopeless. I was desperate, hurting and felt alone. I couldn’t tell anyone what I was doing and using different methods of self-harm no longer eased my pain. As my ED voice became louder, I became more hopeless. I no longer wanted to live, so I began dwelling on, and planning ways to end my life. Hopelessness slowly began to turn into hope after being admitted in Canopy Cove (a Christian based eating disorder recovery center). I spent five months (a combination of residential and partial hospitalization) there, receiving intense individual and group therapy. At Canopy Cove, they believe in a recovery model and believe that recovery is possible for everyone. But you have to be willing to do the hard, and often scary, work of “digging up the root cause” of the disorder. For me that meant not only facing the traumas of my past but speaking them out loud; no longer hiding what had been done to me. As the therapy progressed, the urges to engage in self-harm and any form of ED behavior lessened. And for the first time, I thought that recovery just might be possible. The problem was that I continued struggling with feelings of fear, self-hatred, and intense anger that I had buried deep inside. So, after being discharged and returning home, it didn’t take long at all for the familiar voice of my eating disorder to return, but this time he was louder and even more intent on killing me. I quickly fell into a pattern of severe restricting, purging, taking diet pills, laxative, and diuretics. I was both angry at my ED and hated myself even more than before. I began using these behaviors not only as a way to “control” my life and body but to punish and harm myself as well. 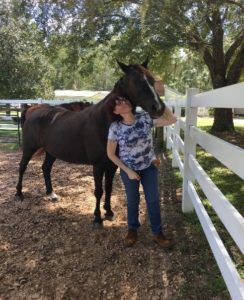 My ED wanted me dead, and so did I.
I returned to Canopy Cove after only five short months at home, but this time I was much worse. I only returned because I was told I needed to and had already lost all hope in ever having a life without my ED and wanted just to give up and die. But God had other plans! The therapist there welcomed me back with no judgment or condemnation. They challenged me daily to fight to live, fight my ED and to find forgiveness for myself. Forgiveness? That was something I not only thought was impossible but really didn’t want to do. How could I forgive myself for putting my husband through this process again? How could I forgive myself for hurting my family now and in the past? How could I forgive myself for continuing ED behaviors and engaging in self-harm, knowing it was wrong to do so? I have to admit; my first thought was “uh -yeah, right! Forgive myself?! Never!” I truly believed I was not, nor would I ever be worth forgiving. But the amazing love of God never fails, and thankfully He was patient with me while I fought Him and His grace daily. Then something changed in me. I was surrounded by therapists who truly love Jesus and live a life that demonstrates His grace and mercy daily. They saw me at my worst, but yet accepted me anyway. That is exactly how Jesus is. He sees me at my worst, and yet loves me, forgives me, and accepts me exactly the way that I am. I began to see His purpose in my life as relationships with the others there began to strengthen. He taught me how to love others exactly how they are, and to pray for them – having the faith that He was in control and already working in their lives as well. He became my driving force. I began soaking in every word that was said to me and was willing to try everything the therapists there suggested. For the first time, I truly began seeing a life for which it was worth fighting! I am home now, continuing therapy, and fighting this ED (I no longer claim as mine) every day. Somedays his voice is screaming loud, vicious, and threatening thoughts. But thanks to God, most days I am screaming back much louder! I understand that recovery is not a straight line, steadily climbing upwards, but more of a series of hills and valleys, but each valley is smaller than the one before. I know God chose to send me to Canopy Cove filling my life with people that love and serve Him, in order to save my life. I may not be fully recovered yet, but I am well on my way! Canopy Cove Eating Disorder Treatment Center is a leading residential Eating Disorder Treatment Center with 25 years’ experience treating adults and teens who are seeking lasting recovery from Anorexia, Bulimia, Binge Eating Disorder and other related eating disorders. We are a licensed rehabilitative provider accredited by the Commission on Accreditation of Rehabilitation Facilities. Trusted and recommended by doctors and therapists throughout the country, our program provides clients with clinical excellence and compassionate care. We increase recovery rates by simultaneously treating co-existing conditions such as anxiety, depression. (We also accept clients with an Eating Disorder and co-existing Diabetes). We provide family education and family therapy throughout the recovery process. (Offered by phone for out of town families). Our Christian-based eating disorder treatment program warmly accepts all clients from various belief systems. Get help now. Call 855-338-8620. Published on November 14, 2018.